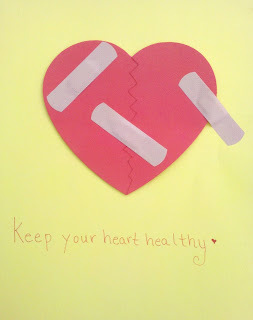 February is American Heart Health Month and this simple foam heart band-aids craft can help you and your child talk about the importance of physical and emotional heart health. Talk about why some hearts need healing and what kinds of things you can do to be more "heart healthy"
Don't forget that maintaining a healthy heart (or working towards that goal) involves making heart healthy choices about the food we eat, the activities we do everyday and even our minds and the words we use. Below are a few links to help you educate your kids about the importance of heart health. What a great idea! 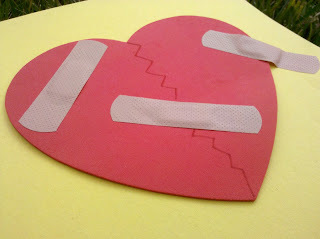 I love the heart with the band aids too. Your site and ideas are fabulous!!! Wish I had known about you years ago! This is a great craft and learning experience for kids. I think my two kids would have a lot of fun and the continued reminder that we all need to eat healthy and exercise.